The very last thing I do, only after I tabulate all the data, is to decide on the title. This week it is "The long term forecast deteriorates further." The percentage of employees who don't get wage raises; is the Taboo undergoing an "extinction burst"? It represents "wage rigidity." In english, that means the percentage of employees who don't get any annual wage increases. It speaks for itself. Nine years into the economic expansion, with an unemployment rate under 4%, and un underemployment rate of 7.8% (only 1% above its all time low), more workers still aren't getting any raises than at any time during the 2001 recession or at any time during the expansion thereafter. This is only 2.7% below its all time peak in 2000, and equivalent to where it was in 2005. But in 2005, about 12.5% of workers weren't getting annual raises. 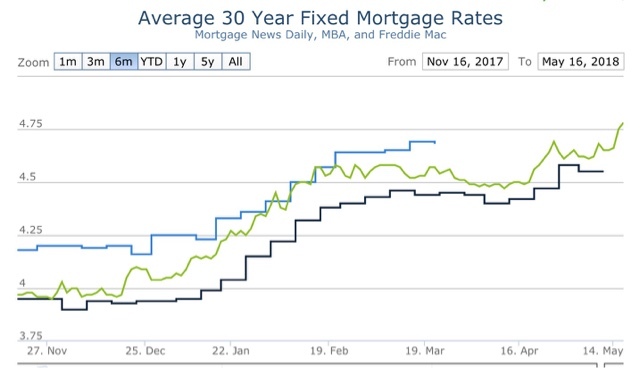 Even now the rate is about 14.5% -- and rising over the past year. This is the Taboo against raising wages in action. This is, in psychological terms, a learned behavior. Even after the advent of "behavioral economics," the failure of economists to employ explanations of macro level behavior based on the concepts of learning and unlearning remains one of economics' glaring blind spots. To refresh, a behavior that is rewarded will be learned over time, and repeated over and over thereafter, even if the rewards become sporadic. And it will even continue for awhile after the rewards are no longer there at all. 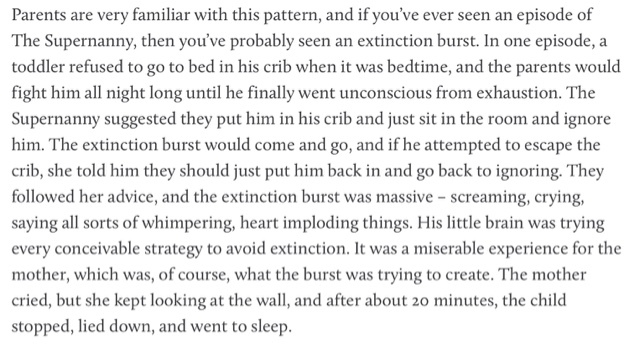 Not infrequently, before the behavior is given up on, there will be an "extinction burst." The caterwauling of employers that they simply can't find qualified candidates (unspoken: for the wages they want to pay them) has all of the earmarks of just such a temper tantrum. For all but a few years in the last 15, many employers became accustomed to having multiple applicants for any job they offered, who had already learned the skills (and presumably been "downsized" or laid off by a previous employer). To put it simply: this was Marx's "reserve army of the unemployed." Employers were rewarded even if they did not offer any raises. They became accustomed to the success of this practice. In other words, they *learned* the behavior. Now the behavior is no longer being rewarded. At the wages previously offered, candidates already skilled at the position are no longer available or applying. Instead, the "quits" rate of employees leaving their jobs for other, better-paying jobs, is near an all-time high. So what does psychology tell us to expect? An extinction burst. And that may be just what we are seeing in the soaring number of "job openings" compared with actual hires. Employers who don't want to raise wages are furiously repeating their learned behavior, trying one last time to make it work. For nearly a decade, this "little expansion that could" has dodged a lot of bullets. But I suspect that the recent trend of rising interest rates and gas prices - if they continue - may finally be the cause of its ultimate demise (not now, but maybe in 18 or 24 months). Initial points to watch are 5% on mortgage rates and $3/gallon on gas prices. In 2016, these were as low as about 3.4%. Even after the US Presidential election, last year they hovered at about 4%. As of yesterday, they were 4.78%. Compared with mid-2016, about $375/month has been added on to the monthly payment for a new $300,000 mortgage. Still, we're not quite at the 5% level yet (to reiterate: my best guess is that it will take 5.25% rates for at least 6 months to overcome the demographic tailwind in the housing market). These have risen to $2.92/gallon. I suspect we will see $3/gallon shortly. I've seen commentary that it will probably take $5/gallon for consumers to cut back on spending generally. This comes generally from the work done by Prof. James Hamilton in which he posits that consumers aren't "shocked" by a mere return to formerly high price levels. But I suspect that, as time goes on, consumers get more and more used to lower prices, so it might not take that much. YoY real GDP started to fade in 1989, and rolled over in 1991 coincident with that invasion. In 1990, gas prices were less than 10% above their 1980 peak by this measure. In other measures, they didn't even quite reach that peak. In today's terms that would mean about $4.50 (compared with 2008's $4.23). At $3/gallon, we will reach a point comparable with 1989. So my suspicion is that consumers will simply re-allocate spending from luxuries like entertainment at first. That will still cause $$$ to flow out of the US to petrosheikhdoms. If we get above $4/gallon towards, $4.50, that will probably be enough for consumer retrenchment. Mind you, I'm not saying that we *will* reach these interest rate and gas price levels. But it's time to start watching. The 2018 list highlights many newcomers and covers a wide range of economic topics. 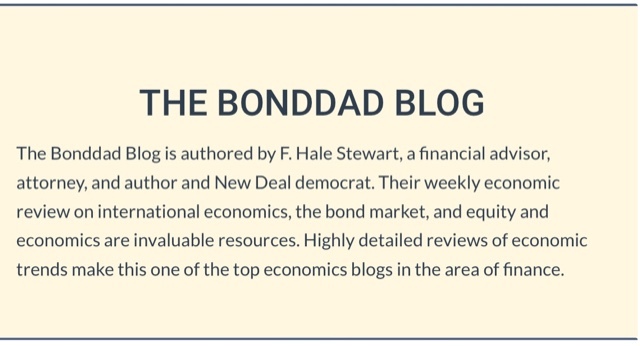 Blogs are included in categories ranging from general economics to specific topics such as finance, healthcare economics, and environmental economics. There are microeconomic blogs, macroeconomic blogs, and blogs which focus on specific geographic regions.. . . . Candidates were chosen based on quality, not popularity or mainstream appeal. This morning April housing permits and starts, as well as industrial production, were released. Not shown, for this expansion the number of total permits issued was lower than only January and March. The first takeaway is that the increasing trend in single family permits since 2011 is intact. Hurray! The second takeaway is that in the last two months, single family permits have declined from their recent high, while multi-unit permits have increased. This *may* mean that increased interest rates have finally bitten enough that some prospective buyers are being forced to back off from buying a single family home, and either buying a condo or renting an apartment instead. This "substitution effect" has happened late on earlier housing cycles, so it is possible it is starting to happen now. If that is true, then we should regard the big surge in permits during the winter as a "buyer's panic," where, fearful of even higher rates in the near future, potential buyers locked in *relatively* lower rates earlier. Time will tell. Like I said, tantalizingly ambiguous. The three month moving average of starts, which I use to cut down on the noise, backed off only slightly from its expansion high one month ago. Since (not shown) there remain an increased number of units that have been permitted but not started, I expect this metric to continue to increase for at least a few more months. 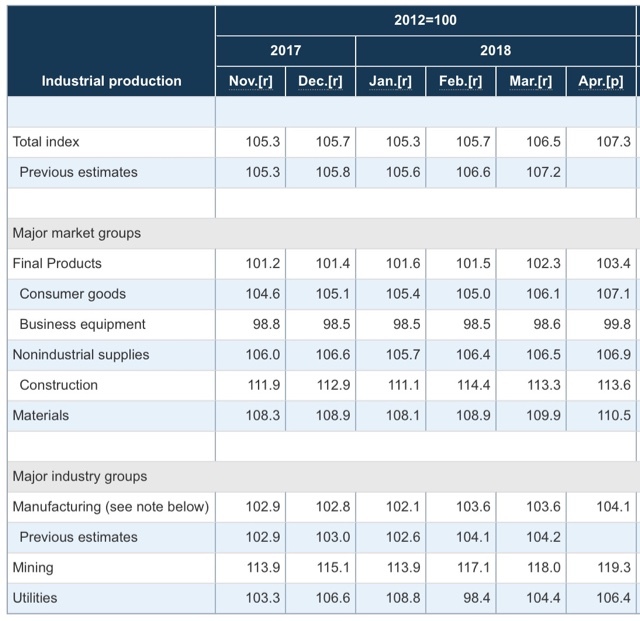 So the positive trend in this king of coincident economic indicators is intact. On September 30, 1981, the 10 year US Treasury bond yielded 15.84%. It has not been that high since. On July 8, 2016, it fetched only 1.37%. It is unlikely to see that low rate again for a very, very long time. Those two dates likely mark the birth and death dates for perhaps the biggest bond bull market in history. Today the 10 year closed at 3.067%, having hit an intraday high of 3.09%. In the 1990s it twice made 3 year highs. In 2006 it made a 4 year high. By contrast, the last time it was as high as it closed at today was 7 years ago in 2011. The immediate cause of death for the bond bull market was likely the ill-conceived multi-$Trillion GOP tax giveaway to the wealthy enacted in December, in the midst of an economy operating near full capacity. Perhaps of more immediate importance, CNBC also reported (via Mortgage News Daily) that 30 year mortgage rates had risen to 4.875% today. That is also a 7 year high. Mortgage rates had been as low as 3.30% in 2013 and 2016. A few months ago I estimated that it would take a minimum of a Treasury yield of 3.25% and a mortgage rate of 5%, for at least 6 months, to overcome the demographic tailwind underpinning the housing market. We are now close to both of those rates. And refinancing debt at lower rates, which did so much to help keep the middle and working classes afloat during the last 30+ years, is now dead. In the longer term, I believe we have now entered an interest rate period similar to the late 1950s-1980, where each economic expansion saw higher and higher interest rates. Meanwhile, the time to rebuild our worn-out infrastructure at ultra-low interest rates has been completely wasted. I can see the future, and it makes me sick to my stomach. About half of all of the long leading indicators are, if their current trajectories continue, on the cusp of turning negative by next winter sometime. 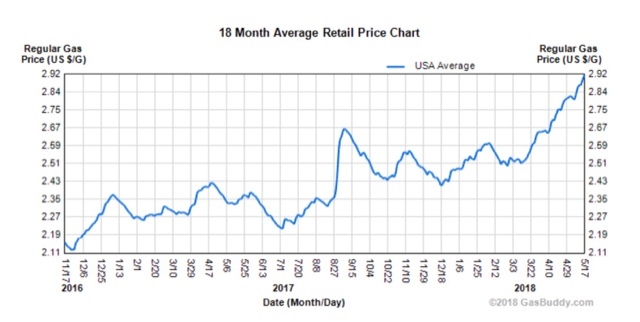 One of the things I note from time to time in my discussions of wage growth is how much its fluctuation in real terms has been affected by gas prices. For example, in the middle of the worst recession in nearly 70 years, real wages actually went up! Why? Because gas prices fell from $4.25/gallon to $1.50/gallon in just a few months. So, what would a long term view of real wages look like if I took out the whipsawing effect of gas prices? You can see how much the secular rise in gas prices from $0.80/gallon in 1998 to $4.25/gallon in 2008 depressed real wage growth; and similarly how the collapse from nearly $4/gallon to $1.70/gallon in 2014-16 helped it. More importantly, notice that real wages adjusting for gas prices rose at a fairly steady clip from 1995 through 2010. Since then, the increase has been quite slight. With some exceptions, real wages rose about 1.5% a year on average between 1995 and 2010. But since then, they have averaged no better than about half of that, +0.7% a year. During the entire last 7 year period, real wages leaving aside gas prices have only gone up about +1.4%. 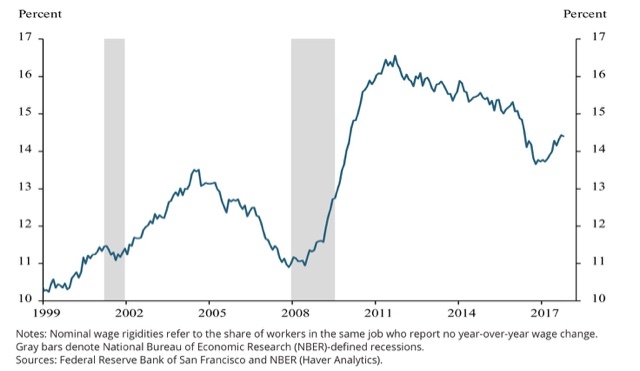 Further, so far it doesn't appear to be a matter of a labor market that isn't tight. In the below graph I have overlaid the U6 broad underemployment rate onto real wage growth adjusted for gas prices. In both the late 1990s and the beginning of 2005, when real wage growth started to accelerate, U6 was roughly at 9.3%. We arrived at that benchmark in November 2016, without any noticeable acceleration in wage growth in the 18 months since.